Welcome to another installment of Art Journaling with Jenny & Aaron! After a craaaazy week last week we are now back on schedule. And it feels good. We love to have this weekly class in our lives. A chance to reconnect with you guys and let loose creatively. Sure, there is some hard work involved, but as artists we are also spoiling ourselves a bit. You'd be surprised how little time there is for getting creative in the life of a self supporting artist. You'd think that each day is about making art...but no...most time is spent doing all the things that surround the artistic process. All the busy work that would bore most of you guys silly. So, cracking open our journals each week to share some creative time with you guys is a blessing. Thanks so so much for being there with us and for all of your positive feedback. You guys mean the world to us! As you can notice at a glance, this spread has a pretty distinct theme. And I'm not usually a distinct theme type of girl. I like to let vibes and happy accidents dictate many of my creative endeavors. But this time around I had a specific goal for these pages. And that's: My Grandma's Roses. Simple as that. And I couldn't go wrong. Roses have always been a fave subject for Aaron and I to paint. And I had this fantastic old photograph to work with. Yes, that's my mom on my grandma's lap! I love that picture. My Grandma's makeup is so pretty and my mom still looks just like that itty bitty girl. So, this week, if me and Aar were going to influence you in any way, I'd say try to work with a specific theme. Think of something you'd like to journal about...or that you'd like to capture visually...gather the needed supplies...the specific colors...and go. You'll find that working within a theme is just as fun as going freestyle. There's a bit of a comfort in it...something to fall back on...and in the end you'll find that it all came together so simply. gather pretty papers and bits. Like I said, Grandma's Roses was my theme. I had some vintage rose wall paper, some Victorian style rose die cuts, rose playing cards, a garden club prize ribbon, and the photo...and tons of fitting stuff. So do yourself a favor and pick a theme that you are well stocked in. back images with watercolor paper. Any image that I had that I wanted to be important on the page, I first adhered it to watercolor paper using a decoupage medium. weight down stencil. Again, Aaron rolled his eyes at my use of butter knives. You can use much more subtle ways of holding your stencil in place...bits of tape in the corners, etc...But I was working fast and I only cared about capturing enough of the stencil pattern in the middle of the page. grab your color mist. We used Mister Huey's in Piglet. mist and remove stencil. Spray your stencil from about 6 - 10 inches away. And mist according to how dark you want your pattern to be. As you'll see with this spread, I later mute this pattern with a gesso wash, so don't worry if you spray darker than you wanted to. You can adjust. adhere papers, let dry. Using your fave decoupage medium adhere each piece by brushing a thick coat on the page, laying down your paper, and then smoothing out. Let dry before applying topcoat. seal papers. Now that the papers are dry, apply a topcoat of the medium of your choice. I used Golden Matte Gel Medium. stamp a pattern. In the area I purposely left blank I used a large polka dot stamp to fill in some pattern. I used paint, which I haphazardly brushed onto the stamp because I'm not going for a pristine look. tone down ink with gesso wash. As I said above, I wanted the pattern that I misted on to be a little less vibrant. So I mixed a little water and gesso together on my palette and brushed the wash over the pattern. paint in circles. Using a 3/4 inch round brush paint in your circles. Try to use colors that appear other places on you page...like if there is a tiny hint of pale green on a leaf and you want to showcase that color...then fill in a big circle with a matching paint color. do some stamping. Stamps and ink are another great layer for your spread. This ring stamp I have resemble my bottle cap stamps but on a closer look you see that it a more detailed image. grab your watercolor pencils. I absolutely love watercolor pencils. You get to doodle and then turn your doodles into paint. blend with a brush and water. Use your 3/4 inch brush...dip in water and then brush over your watercolor pencil lines, softening them and spreading the color out. This created a nice glow around the color circles. outline the flowers. Watercolor pencils are just so easy...just scribble around an image lightly. blend with brush and water. Again ,with a wet brush just brush over your pencil lines and turn them into a washy glow. adhere main images. You've chosen where they'll appear, now brush on you medium, lay down your images and press down to adhere them. add some gluestick paint dots. Dip a gluestick into paint and dab about your pages. The less perfect the better. This is about little punches of color. Barely noticeable at a glance but if you were to take these dots of color away you'd surely notice that your pages lack something. washi tape time! Another crutch of mine. I love washi tape! It's perfect for running along the binding of the book...a great page transition. And add bits in the corners of photos for a scrapbooky feel. consider your pages. You've picked a theme and planned it out, but a spread doesn't come together until you're actually doing it. Get up, walk away, and come back to your book and you'll see whatever is missing. stamp a letter or two. Again, this stamp was in my plans from the outset. A big "R" for Roses and for my Grandma's name...Rita! add a wash of color. I wanted a little bit of an antique glow in the corner. The page needed some warmth. Just mix paint and water, brush on and dab away. add some pretty trims. Fabric trims add a very special and necessary layer to your pages. You've got so much paper and paint going on...the fabric trims soften everything up. add some cap circles. Yes, cap circles are a big part of my look. In this case I wanted dark rings and light rings overlapped. They look fab. Just brush paint on the rim of a bottle cap and then press the cap onto the page. looking good! It is certainly getting close to done and you've got most of your elements laid down. liking it! You've got lots of layers and colors and the theme is represented well...but something is needed...what is it? add some words. Yup...words...you needed words...a big statement to carry your theme home. In this case I wanted big letters that stood out. So I wrote them out with a sharpie on a piece of watercolor paper, cut the words out and decoupaged them to the page. looks good! It's nearly done, so look hard...and think about your theme. date your pages. You're proud of your pages and you want to capture this moment in time...you want to be able to look back at these pages and remember where you were in your life when you rendered these. So please, date your pages...and do it in a pretty way. Hooray! Another week of Art Journaling with Jenny and Aaron! We couldn't be more excited! Oh what fun this has been for us! We hope that you guys are having as good a time as we are. And if you've been with us since week 1...wow! we are just thrilled. Because this has become a part of your week. You're getting creative every single week! The fact that we may have had a hand in that thrills us to no end. We can't wait to see you guys come up with specific themes. You can learn a lot about a person when they get specific. Feel free to grab our button above to share on your blog and be sure to blog about your own Art Journaling and link up below. We can't wait to see your pages! This is so incredibly beautiful Jenny! I'm so sad I don't have one for this week!! Well I actually have one almost completed... but with moving and all, I currently have no clue where my art journal is. ACK. Hopefully I find it by next week's class!! I knew I recognized that second place ribbon! 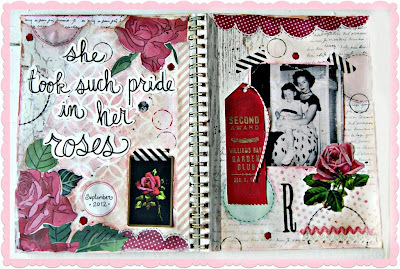 How fun to see some bits you used from my rose pack for your grandmother's page. So glad! Gorgeous page this week!! LOVING that you included the ribbon!!!! I just adore this spread!!! What lovely memories. I almost didn't post this weeks journal entry... but I think it shows it exactly where I was this week - NOT A GOOD PLACE! Thank you so much for the sweet words you sent into my life this week :D They meant so much to me!